Western gardening and especially California gardening is very fascinating and often a little puzzling because there are so many climates present on the Pacific Coast. Here we do not deal with four different seasons as the Eastern and Midwestern gardeners do. Generally speaking, there are only two seasons: the rainy season from November and December into April and May, with some local night frosts; and the dry season, during the remaining months. Though we may not realize it, the mildness of this climate hinders the growing of shrubs and flowers rather than helps. And that applies to growing bulbs also; both the hardy and the tender ones. Tender bulbs, corms and tubers, such as gladioli, dahlias and tuberous begonias, when grown in California gardens, need to be lifted annually so they can be cleaned and divided. 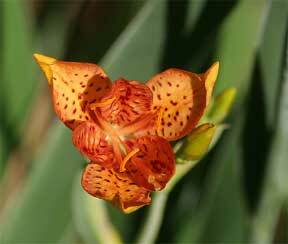 Those not planted deeply, such as Tigridia Pavonia, cyclamen, gloxinia and tuberous begonia would rot during the heavy rains if left in the ground all year. 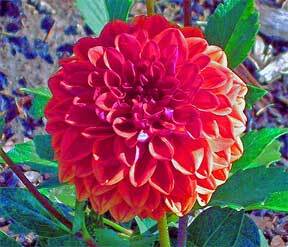 The dahlia is very well suited to the cool, foggy belt along the Pacific Coast, and is an old standby in summer and fall gardens. With all the different types that are available, there is sure to be a dahlia to suit everybody. Gladiolus need sunshine, and plenty of it. The time to plant gladiolus in California depends on the particular section you live in. It is possible in some parts of Southern California to plant gladiolus almost every month of the year. In Central California, on the Coast and in the Bay area around San Francisco and Oakland, fall and winter plantings are not successful. The first lot should be planted from early March to the end of June. It is advisable to use the large corms for the late plantings. Although gladiolus are usually grown for cut flowers in a separate cutting garden, the home gardener often plants them in his mixed borders in groups of twelve or so. With their majestic blooms and shiny foliage, tuberous begonias are really the aristocrats of the Western garden. After years and years of breeding, Belgian, English and American hybridizers have developed double-flowering varieties and have blended the original colors, white, red, rose and yellow, to produce all the shades and tones you could imagine. There are also many bloom forms, the camellia type, carnation type, the single frilledand the true rose form, to name a few. Today most home gardeners can have success in growing tuberous begonias, if they know the environment to provide: a moderate day-time temperature with a little morning or filtered sunlight and cool nights. Montbretias, which are much neglected in California gardens, brighten the borders in late summer with spikes of orange and scarlet. Tigridia Pavonia in bloom is a breathtaking sight in the foreground of a sunny border. Their triangular blooms in salmon, red, yellow, spotted at the centers, are of no value for cutting for they last but a day. Their culture is similar to gladiolus. Be sure to dig up the bulbs after blossom-time, because gophers consider them a delicacy. One of my favorites is the freezia, which is not tender in Southern California. Freezias, along with ranunculus and anemones, are fine companions for tulips and daffodils, all flowering at the same time in spring. The handsome, taller imported hybrids are excellent for indoor culture. 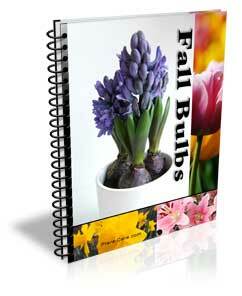 The ranunculus and anemones, offered in California bulb catalogs for fall planting, are tuberous roots. In California they can stand fall planting, if planted in protected borders, although spring planting is often preferred. These conditions are prevalent along the West Coast in California and they will do their best in shaded parts. of the garden, under trees, along a wall, north side of a house or a patio. Tuberous begonias can be grown from seeds started in January, or from tubers which begin to sprout in March or April, or from seedlings bought from nurseries in April or May. After the tubers are placed in flats filled with sand and peatmoss, they will sprout and develop leaves. When two or three leaves have formed, the tubers can be moved to 8-inch pots. They also can be planted directly in the garden, if desired. Use a mixture of coarse sand, leafmold or compost to which has been added some thoroughly rotted manure. It is very important to provide good drainage. Begonias need moisture and have shallow roots, so never allow them to get dry. It is best to water them in early morning. Periodically fertilize them with a liquid fish emulsion. In case natural shade is not available the Californians can grow begonias by providing artificial shade with a lath house. Many variations in building a lath house are possible, from the simple lath structure attached to the garage or house to a free standing one, or the most elaborate conservatory type. Regardless of size, the purpose of the lath house is the same, namely breaking the direct rays of the sun, not allowing them to concentrate too long on one spot. The laths should always run north and south. When made of redwood the lath house can be an attractive structure in a garden. In fact, in inland Southern California, where it is hot, dry and sometimes windy, a lath house is essential. Other shade-loving plants such as ferns, African-violets, fuchsias, clivias and ground covers, may also be placed in a lath house. And a nicely planted lath house makes a very pleasant outdoor livingroom for the whole family. A lath house is also an ideal place to harden off all kinds of seedlings before they are brought into the garden. Recently I learned from a Southern Californian how he trailed his glory lily, Gloriosa Rothscahildiana, from one corner of the lath house to the other, setting off the profusion of red and yellow blooms to good advantage. He had also planted a fine assortment of fuchsias along the sides of his lath house and tuberous begonias in the center. He grew potted cyclamen and gloxinias in his lath house until they were in bloom, and then plunged them in just the right spots in his outdoor show garden. Around his show lath house he planted. groups of white callas, cannas, agapanthus or Lily-of-the-Nile, and Strelitzia Regina or bird-of-paradise flower… to an Eastern gardener this must sound breathtaking.